Want tosave 0,35 kn on this order and become Loyalty program member? AMIX ™ truly offers the best products for recreational athletes and athletes, wellness enthusiasts, fitness enthusiasts and top professional bodybuilders to reach all their goals. 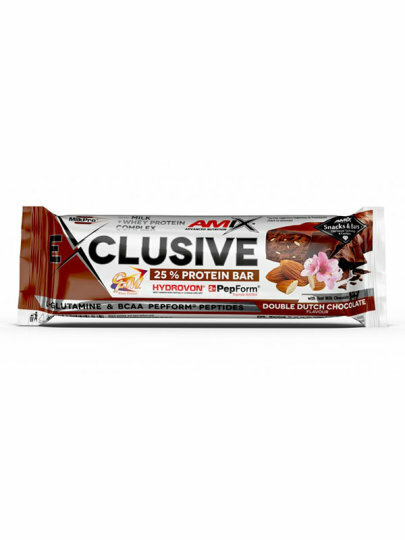 Top quality product, synergistic with a phenomenal flavor, all available at very competitive prices that consumers have turned to loyal users of the AMIX brand.The Amix ™ Exclusive Protein Bar is a delicious protein chocolate with a minimum of 25% protein. Ideal as a snack or before / after physical activity / training. Consume up to 3 chocolates per day. Keep in a dry, cool and dark place.